Not only was it on the third day of the Grand Slam that we saw close contests. Those happen often enough in car racing as well. Years ago, there existed in Wolverhampton a manufacturer who produced racing cars – Sunbeam. Sunbeam was just the name of the products which were not only racing cars but bicycles, motorcycles, cars, buses, airplanes and motors for airplanes. All started with bicycles in 1887. From 1899, cars were produced as well and in 1910 the production of racing cars began. In the 1920s, Sunbeam racing cars set speed records five times and most responsible for this was Louis Coatalen. Coatalen was a Frenchman and he came to England in 1900 to look for work. He was an engineer by profession and first found a job with Humber for whom he designed several rather conventional cars. In 1908, he changed to cycle manufacturer Hillmann and there as well he designed racing cars and the same year, he himself took part in a race on the Isle of Wight. In 1909, he joined Sunbeam in Wolverhampton and his designs got more and more unconventional. His first racing car was an especially light racing car which was very successful. During the First World War Sunbeam constructed motors for airplanes but after the war the production of racing cars was taken up again, though the production in 1926 went to Paris and Coatalen now commuted between Paris and Wolverhampton. The speed record tries continued and Coatalen between other things introduced front wheel brakes. He also fought to include shock absorbers in his cars. Coatalen worked for Lockheed as well. He earned enough money to buy a yacht and owned a villa on Capri. Coatalen was married four times and died in Paris in 1962. Speed records mattered in the last group matches of groups E-H only as far as the constellations in the group tables changed very fast. The afternoon started with a match that didn’t really matter anymore as Rob Cross already was through and Ryan Searle already out – Cross won it 5-2. After that it grew more dramatic. Glen Durrant lost for the second time – this time against Andrew Gilding. I rarely had seen Gilding playing like this before and Durrant found no way to get rid of him or overcome him. And, of course, the fly chose this match to reappear on stage and this time attacked Durrant. Both players had an average over 100. 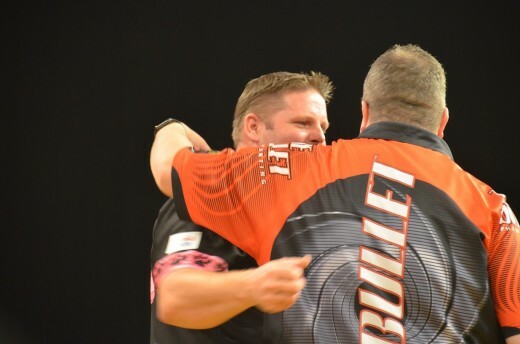 Durrant was not yet out after his defeat but Simon Whitlock had decided not to lose against Gerwyn Price and played his probably best match of the year with a 108 average. Price averaged 104. It was a close win but nevertheless Durrant now was out of the tournament and Whitlock and Price progressed. Next on were the matches of group G. Here as well it had looked quite good for the BDO player Scott Mitchell after the second group match. But first Martin Schindler and Mensur Suljovic came on stage. Schindler already was out but of course wanted to leave the tournament on a high; Suljovic needed a win to be sure to progress. But it was Schindler who won another close contest 5-4. Now Suljovic had to wait for the result of the match between Stephen Bunting and Scott Mitchell. And he was lucky – Mitchell couldn’t maintain his great performance of his second match while Bunting played another good match. So, Mitchell and Schindler were out and Suljovic progressed with Bunting into the next round. In the next group E, the situation was similar. Max Hopp needed a clear win over Jim Williams to progress and then had to wait for what happened between Josh Payne and Peter Wright. There was a lot of pressure on Hopp and you could see it; he even once busted his score. Williams however had no pressure at all and played much better than in his previous matches. So, he was the winner of another close contest. Payne started well against Wright and quickly won the two legs he needed to progress. Then Wright improved and took the lead – hope for Hopp. But Payne recovered and managed to draw 4-4 and Hopp was out of the tournament – and Payne even had the chance to win the match. But Wright made no faults and won with 5-4 his third group match as well. Wright and Payne progressed. Hopp and Williams went out. The final match of the evening was the match between Dimitri van den Bergh and Mark McGeeney and it was easy – the winner would progress together with Rob Cross. But it looked more interesting before the match then during the match because it became quickly apparent that van den Bergh was the better player on the day. van den Bergh won 5-1 and progressed with Rob Cross into the last 16. I jogged over to the shuttle which only slowly filled. But finally, all seats and standing places were taken and we started the always jovial ride into the city, which to be sure was also one of the highlights of the day!